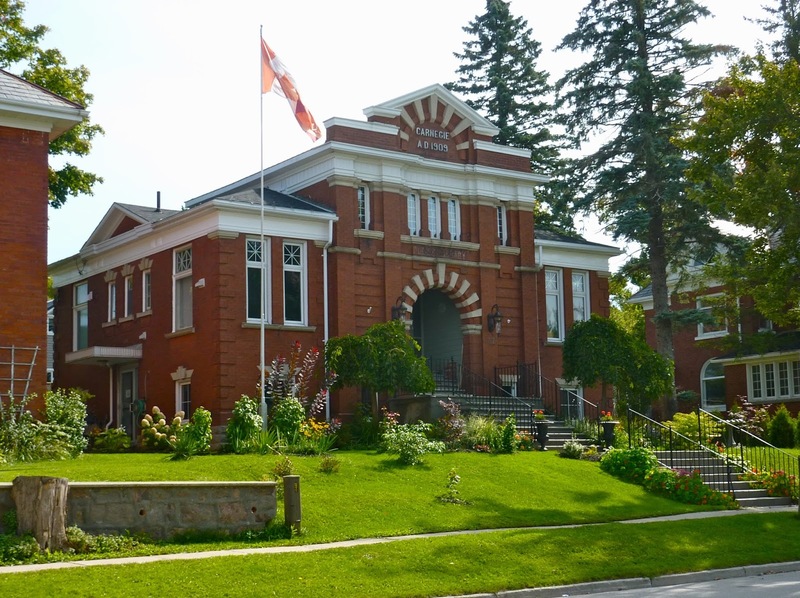 OHA+M (Ontario Heritage Act and more): Carnegie libraries, our communities' public buildings ... and Alice Munro? Carnegie libraries, our communities' public buildings ... and Alice Munro? This rambling “policy story” begins in my hometown of Milverton, Ontario, north of Stratford — on the edge, as I now like to say, of Alice Munro Country. And speaking of things literary, like many small and not-so-small towns Milverton has a Carnegie library. Built in 1909 this stately structure saw a century of service from 1910 until it closed in 2011. I loved the old library as a kid — it was the grandest public building in town (village actually, population about 1100). That impressive flight of stairs, from the top of which which you looked down and across Main Street and further down a street that ran up to the library. (I didn’t know what an axial view was then, just that it was special.) The comforting, almost reverential feeling inside — the high-ceilinged rooms with all those books and, of course, the pervasive quiet. I can still see the shelf where the Oz books resided, and the one with the Hardy Boys books too… but I digress. The library was also the town hall — the village council met for decades in the lower storey of the building. In the amalgamation wave that swept the province in the late 1990s Milverton joined with four neighbouring townships to become the Township of Perth East. The new township needed a new municipal building (I know, doesn’t sound as good as town hall, does it? ), and later a new library. But let’s go back a ways to get the bigger picture — and this brings more public buildings, namely schools, into the mix. In a tale of dominoes all too common in our communities, here is what happened in Milverton. The late 1960s-early 1970s saw an earlier amalgamation tide hit Ontario schools, and the Milverton high school was closed (and students bussed to Stratford and Listowel). But the building was at least re-used as the area public school, although that resulted in the closure of smaller schools round about. The old, handsome but decrepit Milverton public school became for a while the village/township hall and the council met there instead of the library. 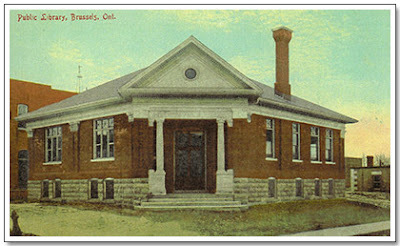 Then the new municipality demolished the old school and built its new municipal offices, which of course also meant that the four former township halls were made surplus. And then the library was replaced with a new one on a different site, leaving the old building intact but surplus, its fate uncertain too. Now many municipalities have done a great job of keeping their Carnegie libraries and adapting them to meet current needs. (Bear with me, I’ll get to the point of all this, eventually). For example — Brussels, Ontario, in the present Township of Huron East (and the heart of Alice Munro Country), recently enlarged and renovated its Carnegie library, which is the same age as Milverton’s and has some stylistic similarities. Local architect John Rutledge designed a sympathetic addition while sensitively refurbishing the original building. When I visited it last month the librarian said that Alice Munro had toured the library the week before and really liked it. Reminds me that the Wingham library, also a heritage building, was just renamed to honour our Nobel Prize winner… but getting sidetracked again. But the Brussels approach would not have worked in Milverton. More space was needed and, as the photo shows, the site was confined, with houses on either side. And all those steps — wonderful for views, yes; for accessibility, not so much. Parking also in short supply. The new library solved these issues. It seemed for a while like the old library was at risk. Our local Architectural Conservancy Ontario branch was concerned. But fortunately it was purchased by an individual who uses it as a residence and office and is maintaining it nicely. From public library to private home... but apparently a good example of adaptive re-use. Did I mention that none of the public (in one case now private) buildings I’ve mentioned is designated under the Ontario Heritage Act?